The Vigor 2862 series router/firewall is the 'Ultimate router'. 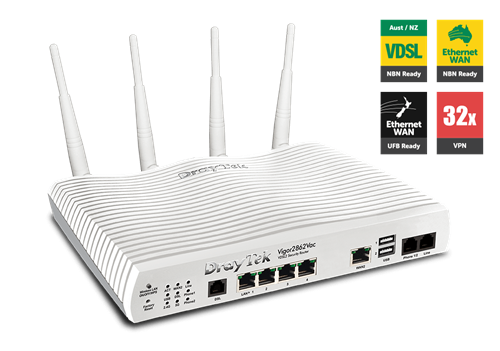 Supporting ADSL or VDSL and UFB it is acked with professional features to increase security, flexibility and functionality, making it ideal as your router for almost any scenario. The Vigor2862 series routers can be rack mounted into a standard 19’ rack or cabinet. The 1RU rack mounting kit (DR101) allows the front panel of the router to be easily accessible as well as keeping it secure in the communications rack.